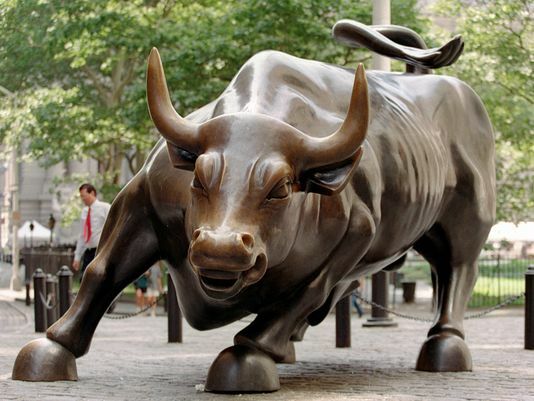 Charging Bull, which is sometimes referred to as the Wall Street Bull or the Bowling Green Bull, is a bronze sculpture that stands in Bowling Green in the Financial District in Manhattan, New York City. Originally guerrilla art, installed unofficially by Arturo Di Modica, its popularity led to it being a permanent feature. The 7,100-pound (3,200 kg) sculpture stands 11 feet (3.4 m) tall and measures 16 feet (4.9 m) long. The oversize sculpture depicts a bull, the symbol of aggressive financial optimism and prosperity, leaning back on its haunches and with its head lowered as if ready to charge. The sculpture is both a popular tourist destination which draws thousands of people a day, as well as "one of the most iconic images of New York" and a "Wall Street icon"symbolizing Wall Street and the Financial District. Editor’s note: the following is a Weekly Market Update (July 24-28, 2017) from Edward Jones, the international broker, who kindly shares its consumer research with this blog. GUEST BLOG / By Craig Fehr, Edward Jones--The S&P 500 ended the week unchanged, but it reached a new record high last Wednesday. While the S&P 500 failed to expand upon its gains from the last two weeks, the Dow Jones Industrial Average rose by more than 1% as company earnings helped propel it higher. With more than half of the companies in the S&P 500 having reported second-quarter results, earnings are up 9.1% year-over-year, signaling that the profit rebound remains intact. Company earnings reports can prompt volatility in individual stocks, but by owning a sufficient number of stocks in your portfolio, you can reduce its volatility. U.S. stocks touched another record high last week, the 29th new high so far this year. The market rallied 12% in the 4 months following the election, reflecting a shift in economic optimism predicated on president Trump’s pro-growth agenda (tax reform, deregulation, infrastructure stimulus). While we didn’t fully share the market’s optimism surrounding the speed or near-term impact of implementation of these reforms, we have maintained our broader positive view for equities. More recently, we think expectations for pro-growth reforms have been appropriately tempered. The upshot from this is that the 1.8% gain over the past three weeks suggests that it’s strong earnings announcements and economic fundamentals – not simply policy hopes – that are powering equities to new highs. Encouraging earnings results – Expectations and optimism have lifted markets through above-average valuations. The next leg of the bull market will need to come from results that live up to those expectations, which we think comes in the form of rising corporate profits. With more than half of companies in the S&P 500 having reported second-quarter results, earnings are up 9.1% year-over-year, signaling that the profit rebound remains intact. With limited room for the price-to-earnings ratio to comfortably rise further, we think ongoing equity market gains will resemble the rate of earnings growth, contributing to our outlook for positive returns ahead, though likely lower than the 15% annualized return of U.S. large-caps experienced since 2012. Overall, however, earnings growth is a powerful driver. Since 1989, in years when S&P 500 earnings grew by more than 5%, the market return was positive in 89% of those years. The Fed is taking a careful approach to withdrawing stimulus – Monetary policy stimulus will take on a new complexion as the economic and market cycle progresses. Last week brought the freshest commentary from the central bank, with the Fed holding short-term rates steady while providing some perspective on its future approach to removing the extraordinary stimulus it has put in place since the financial crisis. Edward Jones expects the Fed to slowly continue raising its target interest rate, with economic readings suggesting that one more hike this year and a couple next year may be appropriate. But the focus will now shift toward the Fed’s balance sheet, which swelled from roughly $800 million to nearly $4.5 trillion in recent years as the central bank purchased bonds (known as “Quantitative Easing”) to suppress interest rates and raise liquidity in the financial system. We expect the Fed to gradually wind down its balance sheet, commensurate with the ongoing progress of the economy. To that end, last week’s U.S. GDP report showed that the economy grew by 2.6% in the second quarter, up nicely from the 1.2% pace in the prior quarter. Particularly encouraging was the lift in consumer spending (up 2.8% versus 1.9% in the preceding period) and a strong increase in capital spending, signaling that business investment may be on the upswing. Overall, this supports the view that the economy is capable of expanding without the need for such extraordinary central bank stimulus and, along with still-moderate inflation, should allow the Fed to maintain a gradual approach to rate hikes and balance-sheet reduction. Positive fundamentals won’t eliminate pullbacks – The VIX index (a barometer of stock market volatility) fell to an all-time low last week. While we think the backdrop of expanding domestic and global economic growth, rising corporate earnings, and still-favorable interest rates should inspire confidence in the broader outlook for the market, we’d caution against complacency. The foundation of positive fundamentals will, in our view, prevent a bear market, but it won’t eliminate short-term swings. The VIX index dropped to a reading of 9.4 last week (for perspective, the 20-year average is 20.7). Historically, when volatility has fallen 50% below its long-term average, it rose by an average of 25% over the following three months. We think the bull market will continue, but we expect volatility to be higher along the way, including the rising potential for a short-term pullback. Fortunately, with the economy and corporate profits providing solid support, market dips would be compelling buying opportunities. Source: Bloomberg. *5-day performance ending Friday; **Bonds represented by the iShares Core U.S. Aggregate Bond ETF. Past performance does not guarantee future results. We are set up for another busy week with more than 130 companies from the S&P 500 reporting earnings. On the economic front, vehicle sales will be released on Tuesday, and July's jobs report will come Friday morning.